Information centres are located at each of the main entrances to Kananaskis Country, but the best way to do some pretrip planning is using the website provided by the Alberta government (www.albertaparks.ca). Another good source of online information is Friends of Kananaskis Country (www.kananaskis.org), a nonprofit organization that promotes educational programs, is involved in a variety of hands-on projects, and promotes Kananaskis Country in partnership with the government. 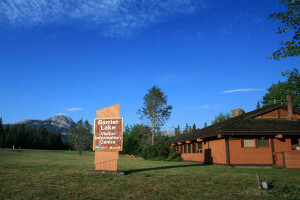 A short distance along Highway 40 from Highway 1 (but north of Barrier Lake), Barrier Lake Visitor Information Centre (403/678-0760, 9 a.m. to 6 p.m. daily in summer, 9 a.m. to 4 p.m. daily the rest of the year) is a good place to start your trip into Kananaskis Country. At the excellent Peter Lougheed Provincial Park Visitor Centre (4 km/2.5 miles along Kananaskis Lakes Road from Hwy. 40, 403/678-0760; 9 a.m. to 5 p.m. daily in summer, 9:30 a.m. to 4:30 p.m. daily the rest of the year), exhibits catalog the natural and cultural history of the park through photographs, videos, and hands-on displays, and a great display tells the story about the bears of Kananaskis Country. The knowledgeable staff hides hordes of literature under the desk, but you have to ask for it. Also ask them to put a movie or slide show on in the theater; most revolve around the park. The movie Bears and Man is a classic 1970s flick dealing with public attitude toward bears–one of the first documentaries to do so. A large lounge area that overlooks the valley to the Opal Range is used mainly in winter by cross-country skiers but is always open for trip planning or relaxing. South of Highwood Pass on Highway 40, Highwood House (Highwood Junction, 9 a.m. to 5 p.m. Fri. to Sun. May to June, 9 a.m. to 8 p.m. daily July to Sept., and 9:15 a.m. to 5 p.m. weekends only Oct. to Apr.) has gas and a grocery store.